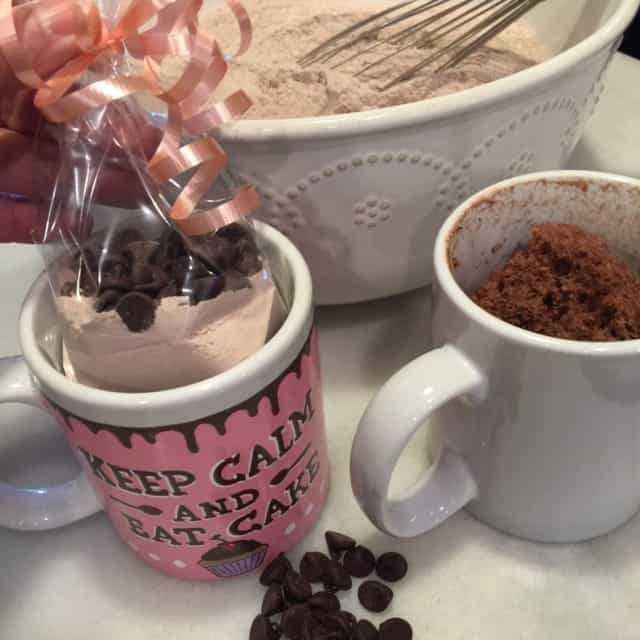 Mug cakes are everywhere, so I decided to jump on the mug cake wagon and bring you a super fast, three ingredient “recipe” along with a fun new product that will celebrate anyone, and any occasion, just by adding water. It’s a party in a box! It was back in 2015 when I had the idea to paint mugs that could be used specifically for the mug cake recipes that I was seeing all over the internet. I knew I wanted to include a pre-made cake mix along with my hand-painted mugs but it needed it to be extra simple for gift giving purposes. After all, most people don’t carry eggs in their pockets when they have a taste for a little cake at work. 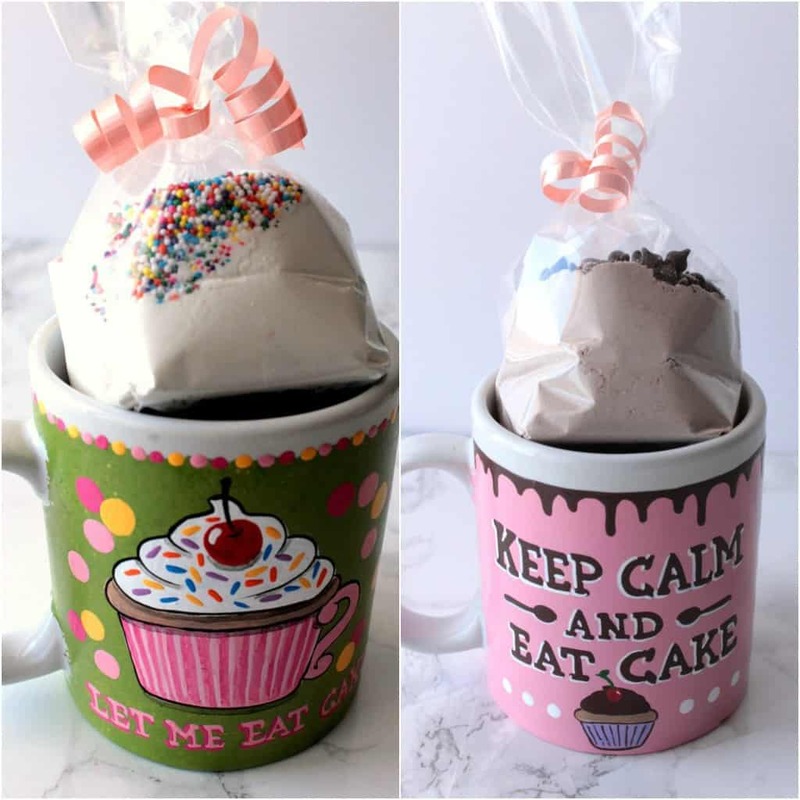 The recipe I’m sharing with you is one from Amanda, over at I Am Baker, and it’s absolutely perfect for this mug cake, cake mix gift set. It’s crazy easy and requires only three ingredients: One box of angel food cake mix, one box of cake mix (your choice of flavors), and water. Easy peasy! So you see? Mug cakes come in many flavors and can be pretty involved as far as the ingredient list goes, or as simple as just add water. Each mug cake, cake mix set you order comes complete with a uniquely hand painted mug, a single serving of cake mix (your choice of either chocolate, chocolate chip, OR vanilla with sprinkles), a candle for celebrating, and a gift box which is ready for wrapping. Also included with each mug is the easy to follow just-add-water directions. It’s that simple, and all for under $20 (not including the shipping and handling). Custom orders are also always welcome so if you have a specific idea or design in mind, (i.e. your daughter’s ballet teacher, your son’s t-ball coach, or even your hairdresser or dog groomer), I can paint that for you! Should you have any questions regarding this post, or anything else you’ve seen on my site, please don’t hesitate to contact me directly or leave me a comment in the comment section below. It is always my distinct pleasure to get back to you with a reply just as soon as I possibly can! Aw, these make such cute gifts and are so easy to put together, perfect! These are so adorable! 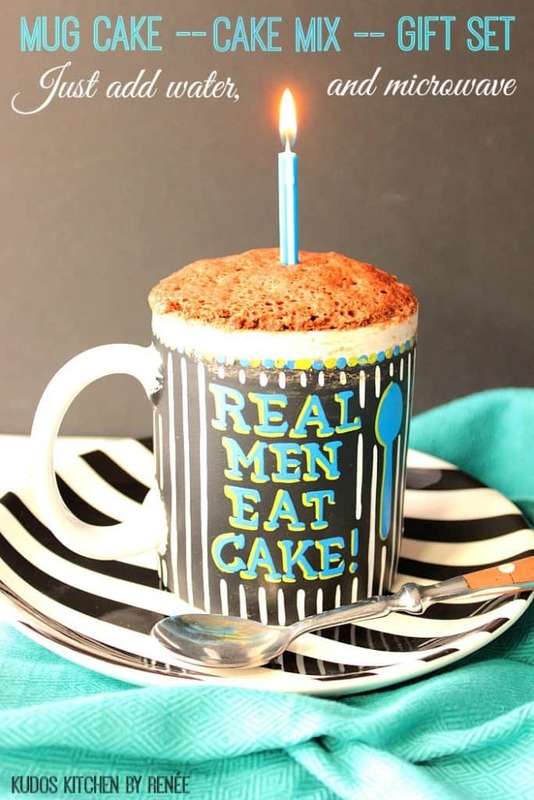 They would make the perfect gift, I love that you cook the cake in the mug too since it’s just enough for one serving! Thank you so much. It’s a fun and tasty way to eat cake. And it’s perfectly portioned, which I need to help me stay on track. What a great, smart idea to use angel food cake mix for the eggs. Duh. And much more economical than meringue powder or powdered eggs. Love what you’ve done with cake mugs! Thanks, Katrina. Sure does beat the initial mug cake recipe I was going to use in the first place. I adore mug cakes! 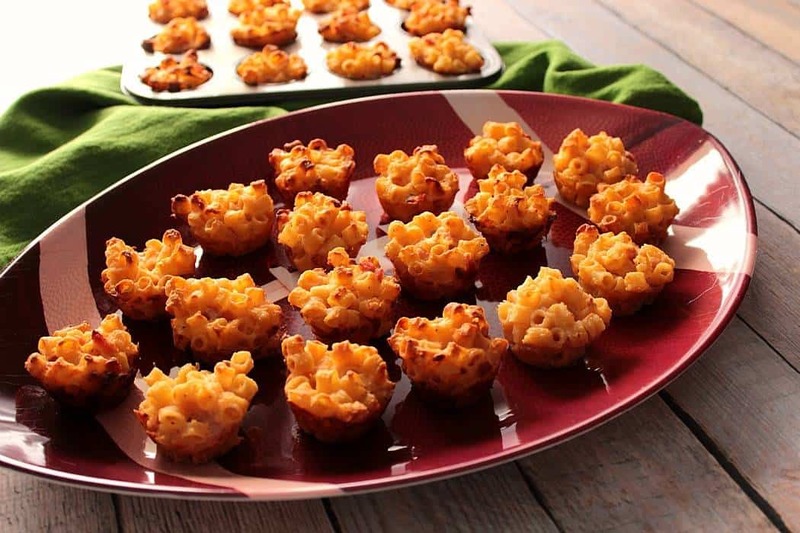 They are quick & easy & perfectly portioned for one. 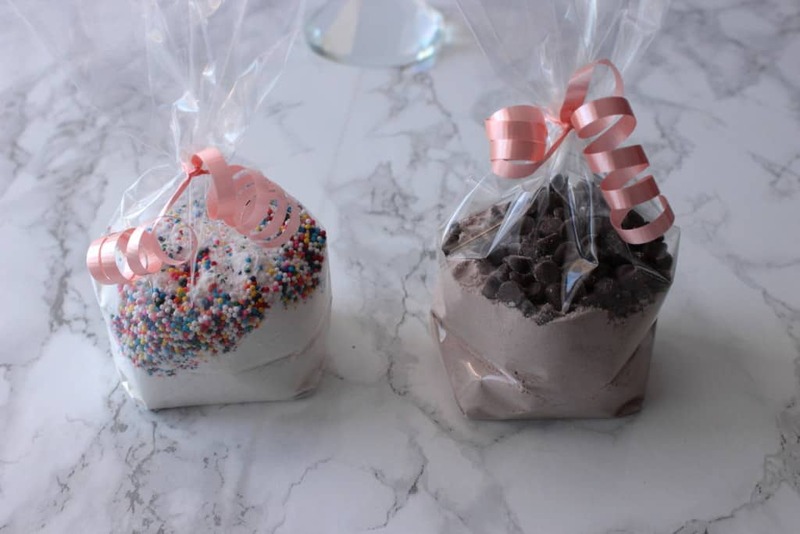 🙂 What a clever idea to make mug cake gift sets! I see this mug cake in my future, this weekend!! You have a serious talent, my friend. Your mugs ate just too cute! I line the idea of just adding water for a gift kug cake. You’re too kind, Kirsten. Thanks for the lovely compliment on the mug cake kits. Your mugs are so neat! And you just add water? I don’t get how that works. So I’ll just need to try it out for myself! 😉 Love this idea. I totally believe you about never having a mug cake before, Heather. Believe it or not, either had I until I had the idea for these mugs and cake mix sets. Haha! You are so talented. These mugs are gorgeous, and perfect for gift giving. And the mug cake looks might delicious. I used to make mug cakes and brownies for the kids when they were little. I think we called them single serving cakes or something back then. Our next door neighbour was a police officer who had a thing for meal prep and freezing things. He taught me how to freeze single serving muffins, and how to make mug cakes back in the day. He also taught me never to speed but that one never stuck. Oh my – what a great idea! These would make the perfect gift! Thank you so much. I like the way you think. Thank you, Paula! Considering they’re just add water mug cakes, they are pretty delicious! What adorable mugs, and great gift ideas! So fun!